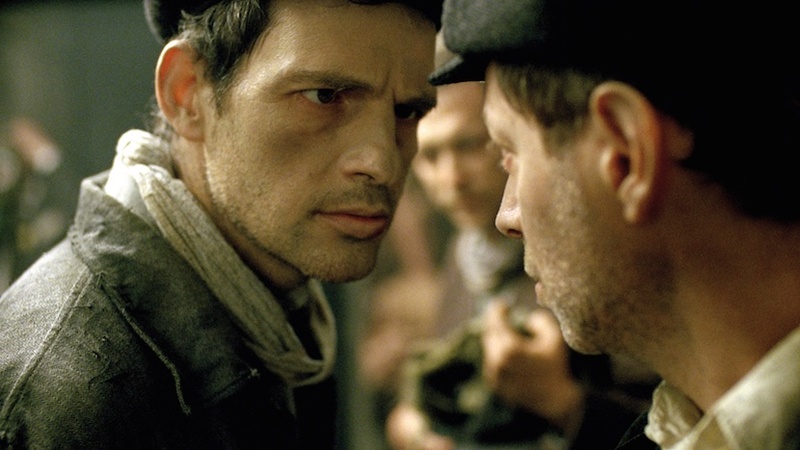 SON OF SAUL is a devastating and rightfully traumatic debut feature from the Hungarian director Laszlo Nemes. For 107 minutes he keeps his camera tightly focused on his protagonist - Saul Auslander (Geza Rohrig) - so that we only see the context of his action on the edge of the screen. We soon become grateful for this obscurity and start to wish that he had been as kind on our aural sense. Because everywhere we hear the mechanics of fear and death. Saul is a Sonderkommando in an un-named death camp. As the movie opens he's helping newly arrived victims hang up their clothes before a "shower". He is ordered to stand next to the door of that room and hear them killed before he goes to the business of clearing up their clothes, washing out the room and disposing of the bodies. As the film goes on we will explore every part of that process - the men who stoke the fires of the crematorium with coal, the men who dump the ashes in the river, the men who perform the autopsies. All of them victims, and all of them living with the threat of being on the next list. The plot that drives us through this claustrophobic intense description of mass-murder is Saul discovering the body of a child who he believes to be his son. This sends him on a desperate mission to find some shred of humanity and religious meaning in this hell, by giving his son a ritual burial. To do this, he needs to smuggle out the body, find a rabbi, have the prayers said, and dig a grave. And such an impossible task, in the midst of ever-watchful guards, will put his own life, and those of others, at risk. The power of this film is seeing others try to reason with Saul - is the boy even his own son? - and to see Saul almost driven mad by his desire to exert this one act of meaning in a desolate place. The intensity - as the camera rarely leaves his back or his face - is almost unbearable, knowing as we do the likely outcome. I cannot praise the director, Laszlo Nemes, enough for daring to take on this subject and finding a technical way of doing so that both increases the intensity of the experience but also absolves us and him of any exploitative depiction of the horror. This film is the most rare of things - both a technical and emotional masterpiece. SON OF SAUL has a running time of 107 minutes and is rated R. The movie played Cannes where it won the FIPRESCI Prize, and Laszlo Nemes won the Francois Chalas Award and the Grand Prize of the Jury, and Tamas Zanyi won the Vulcan Prize for Technical Artistry. The movie also played Toronto and London. It opened earlier this year in Hungary, and opens on November 4th in France, November 5th in the Netherlands, November 13th in Poland, December 4th in Spain and on December 18th in the USA.